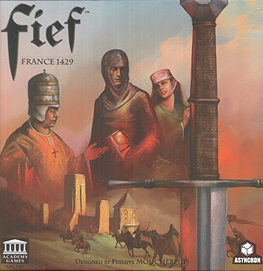 Fief - France 1429 is a game of dynastic ambition, where players lead noble families in the medieval Kingdom of France. Each family is comprised of noble lords and ladies that strive to attain Royal and Ecclesiastical titles through intrigue, diplomacy, marriage alliances, betrayals and war. These titles not only gain your family wealth and power, but also influence in determining the next King of France and Pope... A sign of true power and the basis of a new French dynasty!